Rotary International President Elect Ian Riseley visits the Brades Primary School. For the first time in the history of Rotary International, an incoming president has visited the island of Montserrat. 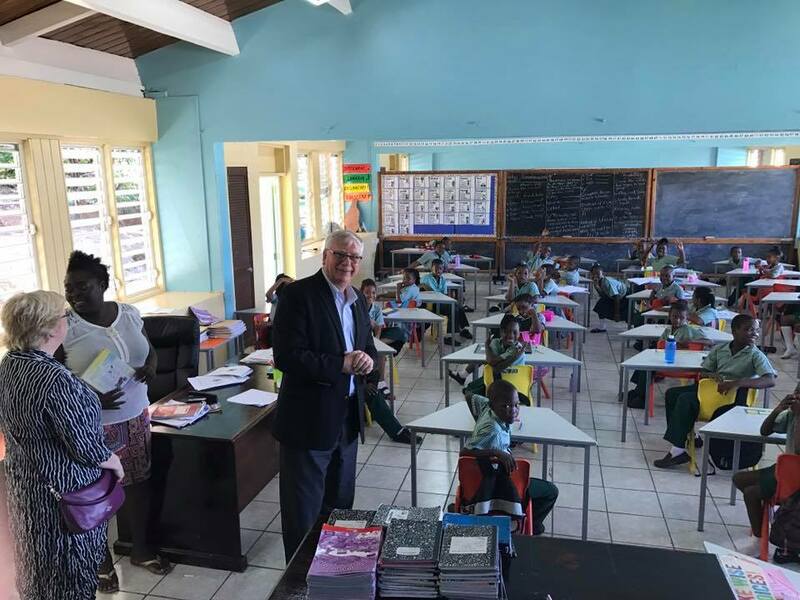 Last Friday, November 4, president elect Ian Riseley spent the day with local officials visiting various community projects they have supported as well as fellowship with rotarians. Riseley was accompanied by his wife Juliet, along with the District Governor Roger Bose and the District Governor-Elect 2017-18 Waddy Sowma of Suriname. The delegation met with Hon. Acting Premier Paul Lewis and discussed among other things the geothermal project. The president elect said he’s offered to connect the government with rotarians in New Zealand which is much further ahead on geothermal energy. Throughout the day, the group visited local projects which had been supported by the Rotary Club. These included the science lab at the Montserrat Secondary School and the dictionary project at the primary schools. The new president declined to disclose his plans for the coming year, stating that he first needed to share his vision with all of the district overnors when they gather in San Diego in January 2017. He said he will continue to encourage the leadership to work to make a difference, be even more active. Riseley added that during his term there will be more focus on environmental issues. District Governor Bose said the visit by the new rotarian leader was a “very big deal” adding, this was a mark of what kind of leader he intends to be as it was important for the new president to familiarise himself with the issues facing each district so problems can be addressed. Sowma, said he was very pleased to accompany his colleagues and new boss. He added that the current district of which Montserrat is a part, will be expanding from 14 to 17 in 2017, with the addition of Curacao, Aruba and Bonaire.